I was lucky enough to spend some time last Sunday with the sheep that grow the wonderful wool I love to knit with, the people who take such good care of them, and the extraordinary woman behind the Foxfire yarns and fibers. There were cormo sheep, border leicester sheep, angora goats (Butch and the tiny Gypsy), and llamas (Caitlyn and the freshly shorn Crackerjack). 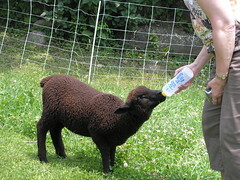 But the highlight of the day were Mistral and Georgia -- these bottle-lambs behave more like puppies than lambs! Mistral was especially curious and looked through our knitting bags. More pictures HERE! Thanks again to our hosts for a great visit!